Ej. 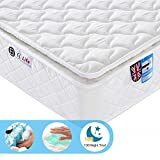 Life Mattress Reviews. Are They Worth Buying? Have you ever found yourself having troubles sleeping and even if you do, you wake up feeling tired? Choosing a good bed is not such a difficult task, but there are some factors you should always keep in mind. Let’s focus on one of the most important factors anyone should consider when choosing a good mattress: the brand/manufacturer. You want to pick from a well-known brand. Speaking of manufacturers, it is among the best brands in the UK. The brand produces not only high-grade mattresses but also top-quality home and office furniture. But we’re here to talk about their mattresses. What makes their products so incredible? Are they worth buying? What are the benefits you would get from these mattresses? Read on to find out. This Ej. Life mattress is one of the best on the market, and it comes with a thickness of 10.6 inches. As mentioned, it is a memory foam mattress that features pocket springs for a luxurious sleep. It is heavy, which might need around two people to carry it to the bed. This Double Mattress weighs around 30kgs, and measures 190cm by 135cm by 27cm. It is firm and comfortable enough, and you can be sure of a good night sleep. One thing that makes this Ej. Life mattress worth buying is the unique design of the top player. The top layer comes with a 3D breathable fabric. This helps to reduce pressure points when you sleep on it and also give you a luxurious feel throughout the night. Furthermore, it implies that you wouldn’t experience excessive sweating during the night. It features 9 comfort zones that offer precise support and they also relieve pressure on your hips and shoulders. It measures 190cm by 90cm by 22cm, and weighs just about 20kgs. You might need some help to carry it. This is a memory foam Ej. Life mattress that also combines the pocket springs and the unique 3D breathable layer. It measures 142cm by 28cm by 28cm, and weighs about 30kgs. It also features 9 orthopaedic zones that relieve the pressure points. Even with its heavy weight, it is as comfortable as ever, and you will enjoy a sweat-free night. If you are looking for a large one, this should be the right pick for you. This UK King size Ej. Life mattress measures 150cm by 200cm by 22cm, and it weighs around 33kgs. It comes in natural colour, and it also has 9 orthopaedic zones, along with pocket springs. The 3D breathable fabric offers better air permeability, the temperature will adjust according to the surrounding, and you’ll enjoy an enhanced cushioning. This is one of the lightest Ej. Life Mattresses you can buy. It only weighs 18kgs, and comes in with a thickness of just about 6inches. It comes with heavy-gauge tempered steel coils that offer an exceptional support and longevity. It features fire-resistant barriers that assure you of safety in the house. You will receive it when it’s rolled and compressed for easy setup. It also comes with a quilted fabric cover, along with a memory foam layer that delivers a comfortable cushioning for a luxurious sleep. Ej. Life is a brand that delivers both top-notch mattresses and indoor furniture. As their slogan says, they are “Your personal sleep expert”. Generally, they customizes their mattresses to meet the various needs and preferences of sleepers. Their mattresses come with individually wrapped pocket springs, which offers independent support for the entire body. For the record, when your mattress doesn’t offer enough body support, you will wake up feeling exhausted with back pains. Typically, their mattresses have been customized to support individual areas of the body for a comfortable sleep. They come in different sizes and thickness to let you choose the one that meets your preferences. Furthermore, you’ll get to choose the one that falls within your budget. Why Should You Choose Ef. Life Mattress? Their mattresses are pocket sprung. I know you’re wondering “what’s a pocket sprung?” Let me enlighten you on that. The Pocket Sprung Mattress is that which springs have been sewn into individual fabric pockets, and the fabric pockets act as shock absorbers. Typically, it is the best if you and your partner have varied weights. They balance without sinking on either side. All their mattresses comply with the UK Fire Safety Regulations. These mattresses come with a 10-year after sales service warranty. This means that they can stay strong and reliable for as long as 10 years. They are all sold with a return policy. If there is an issue with the product, you simply contact the seller and you get a full refund or replacement. The refund service is available for three months after you receive the product. So, if you are not satisfied with the item in three months, you’ll get your money back. Their mattresses are orthopaedic. This means that they have been specifically designed to support the skeletal system. In other words, no more pains or tiredness when you wake up. Ej. Life Mattresses are not only luxurious and overly comfortable, but they are also one of the cheapest on the market. Most of them are less than £150, and you can also find a decent unit that goes for less than £65. The best part is that they have a money-back guarantee, so there’s nothing to lose. These mattresses are currently on a discount offer, and you just can’t miss the chance to get one of them.